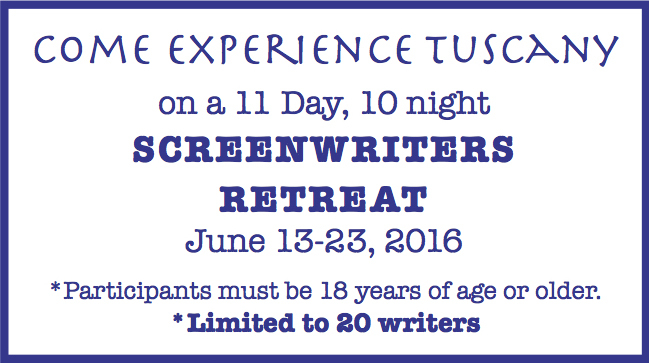 Join CSA, Final Draft, and Ken Feinberg, for a one-of-a-kind work-study-vacation writers experience in beautiful Tuscany. Every participant will join us in Cortona, Italy for a creative work/study/vacation experience. Whether you’re a beginner or a seasoned writer, you will be motivated & inspired by the adventure, history and culture in this quaint Etruscan village atop a mountain in central Italy. Daily morning writing sessions with Ken Feinberg will include methods from the Artist’s Way and other creative processes, allowing you to expand your writing techniques. Writers will attend daily afternoon Tuscan excursions designed to “fill the well” of their imaginations. These excursions will be followed by un-scheduled evenings during which participants can explore, dine, and write. Writers will bring their updated works to class daily. Come add to your toolkit as you delve into the exploration of story. This dynamic duo will select multiple short screenplays to shoot during the CSA Acting Intensive the following week. Seven shorts were produced in 2015; one of which was honored with an award at the WIFTA Short Film Festival. All 7 shorts were screened at the 2015 Gwinnett Center International Film Festival. If writers elect to go to Cortona a few days early on their own, they will also have the unique opportunity to enjoy an annual village-wide medieval celebration that occurs right before our retreat. Create the opportunity for one of your stories to be produced as a film in picturesque Cortona, Italy! Thank you to Final Draft who was a sponsor for last years retreat. CSA hopes to be sponsored again to enhance your writing experience! We are waiting to hear back from them, so stay tuned for more info! Be Inspired. Come to Italy. IMDB credit if your script is selected for production. Airfare, Departure Taxes, Passport, Travel Documents, 8 Dinners, a Laptop, a 14″x17″ or larger sketchbook/drawing pad, any personal expenses and/or purchases, any individual excursions and/or transportation. *All Fees based upon double occupancy. Add $30/night to upgrade to a single. *All excursions are subject to change if local circumstances prove impossible. Investment: $2999.00 *Talk to your CPA regarding tax deductions. Email Ken at ken@csatl.com or call him at 678-481-8191 for more info. Q. Do I need to speak Italian to go on this trip? A. No. All classes/workshops will be conducted in English, and we will have english speaking guides on all excursions who can also act as interpreters as needed. Q. Is there a payment plan for this program, or do I need to pay everything when I register? A. If needed, you can make payments in 4 installments. If you pay when you register, you can elect to pay with a credit card via PayPal, with cash, with a check, or with a cashiers check. If you elect to make payments, you need to submit post-dated checks with your “Writer Enrollement & Travel Agreement” as outlined in the agreement. Q. I can’t find the “Writer Enrollment & Travel Agreement” that I need to fill out & send in to complete my registration. How can I get one? Q. What writing tools should I bring with me? A. A journal, a sketch pad, and a laptop or tablet that is compatible with the latest version of Final Draft. Q. Can I bring a companion on the retreat who does not want to take the writers workshops? A. We highly discourage non-participating companions on this retreat. While you will have time on your own away from the group, we suggest you use that time for personal reflection, artistic exploration, and independent writing blocks. If you have a companion who wants to join you, we suggest that they choose to become full participants of the program even if they do not intend to become a professional writer. Since we will be employing techniques that both beginning & seasoned writers can use, anyone and everyone can benefit from this experience. Q. Can I come earlier, or stay longer if I want to travel in Italy or Europe before or after the retreat? A. Yes. Since the flight is not included, you can do whatever you want. Monday, June 13 is a travel day. The program in Cortona begins with our “Welcome Wine Reception” on Tuesday, June 14, 2016. You may arrive and/or leave on your own via the Venice airport or another location via bus, car, or train & bus (the train does not arrive directly in Cortona). Florence, the city from which the group transport departs from; is beautiful, rich in art and history, and is worth exploring. A common comment made by participants who did not spend time in Florence is that they wish they had arrived a bit early and spent time there. Q. Do I have to meet you at the airport in Florence, or can I meet you in Cortona? Likewise, do I have to go to Florence with the group after the retreat ends? A. You do not need to meet us at the airport, nor do you need to return to the Florence airport from Cortona; but there is only 1 group transportation provided, and that is to/from the airport. Any travel not desribed in the inclusions is not part of the cost of the program, and would be the participants responsibility. In the past, there have been a few late flights, and the group transportation can’t wait, so we do suggest arriving in Florence early in the morning, or a day early to avoid missing the group transport. A bus from the heart of Florence to the airport is currently 6E, and a taxi is 20E. Q. What happens if I miss the group transport to Cortona? A. You will receive specific instructions at the orientation outlining how to arrive in Cortona on your own via taxi, bus, and/or train and the fees involved for each mode of transportation. Also, at the orientation, you will be asked to sign a form indicating if you would like a CSA representative to wait for you in Florence & accompany you to Cortona with the understanding that you would be responsible for all fees incurred for their food/transportation/lodging, or if you would feel comfortable arranging your own transportation without the help of a CSA representative if you miss the group transportation. Q. Can I alter any part of the package? A. The package is a group package and the prices have been discounted to a group rate; however; you may elect not eat the group meals and/or to not attend any or all of the group excursions if you choose. Q. If I have food allergies, can you accomodate my needs? A. If you notify us well in advance of any food allergies, we will do our best to accomodate your needs while offering the best variety we can in the meals you will eat. Tuscn food is world renowned for their fresh ingredients and amazing flavors. Please, be considerate of our hosts & their culture and introduce yourself to the wonder of Tuscan cooking. We appreciate you limiting your special requests to true food allergies. Q. Why are all breakfasts & Lunches included, but dinners aren’t? Why didn’t you make it “All-Inclusive”? A. Like the rest of Tuscany, and Italy for that matter, the food is phenomenal and we feel that you should be able to experience multiple venues of your choice in addition to the food we provide to you. We also believe that you need time for yourself that is not group time; and the evenings are a wonderful time to explore the area and do some personal refelction. In this way, you are free to choose when you eat, when you explore, and when you write.